Historians love to stumble on vital cultural exchanges that went under the radar – or were only vaguely noticed – by earlier researchers. 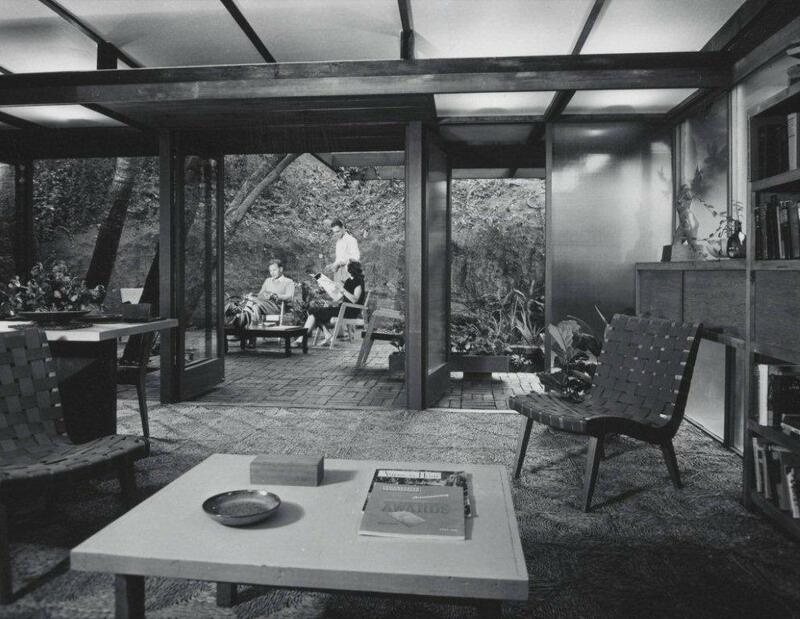 Here's an exciting new example: the handover of cutting-edge California modern architecture concepts from brilliant young Los Angeles architect Gordon Converse Drake to talented Sydney designer Douglas Burrage Snelling between 1947 and 1952. Drake died (age 34) in a skiing accident in 1952 – the same year that Snelling (then 35) was registered in New South Wales to practice as an architect. Both had led successful small practices right through the 1940s. They both were living in Los Angeles during late 1947 and early 1948 – and might have met at one or more architecture events during that northern winter. From 1947 to 1952, their designs for houses and residential interiors were remarkably similar. Both proposed modular floor plans, using strategies earlier tested by Drake's employer and friend, Harwell Hamilton Harris. Harris had been apprenticed to one of Wright's former students, Richard Neutra, whose 1940s works also directly influenced both Drake and Snelling. In 1949-50, Douglas Snelling designed a house for Newport, New South Wales, looking like Southern Californian modern, in particular the Gordon Drake modular designs and some Frank Lloyd Wright influence, especially in the flow of the plan. Snelling studied under Wright [sic] but he was not, if this design was an indication, wholly converted to the Wrightian forms of the 1940s. A design blend was skilfully developed in the Newport house. During the late months of 1947, Snelling was based in Los Angeles, working as a draughtsman for Beverly Hills architect (former 1930s MGM set designer) Douglas Honnold. Snelling and Drake both were born during the First World War, were equally good-looking and sporty, with glamorous young wives (who were both unhappy with their married lifestyles during that year). The Snelling house design that Johnson wrote about was published (via model photographs and plans) in a 1949 edition of Arts and Architecture, the legendary magazine then edited by John Entenza. Another Snelling modular house concept was published in Arts and Architecture in 1950. However there were no further signs of either Drake or Snelling in Entenza's magazines through the 1950s. Before Drake died, he was estranged from Entenza (suggests California historian John Crosse) and after 1950 Entenza ignored Snelling in preference to publishing Australian works by Snelling's younger Sydney rival, Harry Seidler (suggests Snelling's Sydney biographer, Davina Jackson). Since 2010, John Crosse has been publishing new research on Gordon Drake, via his blog Southern California Architectural History. Download the PDF of his current chronology and bibliography: Gordon-Drake biblio. Crosse's post on the publicity partnership between Drake and photographer Julius Shulman is here. Since this article was posted, we have received an excellent 1996 article on Drake, written by Professor Neil Jackson, one of Britain's leading scholars of California modernism (with the University of Liverpool in London). Titled 'Californian promise', it was published in the March 1996 issue of The Architectural Review. It mentions Drake's influences on Glenn Murcutt, the internationally celebrated Sydney architect who began building Miesian, modular, steel-and-glass houses from the mid-1970s, after Snelling closed his practice. Murcutt later wrote the foreword for a 2011 reissue of the classic 1956 book California Houses of Gordon Drake, by Douglas Baylis and Joan Parry. The reissued edition, from William Stout Publishers in San Francisco, included a new Introduction chapter by Pierluigi Serraino.